Enjoy the new standard in urban living in an Uptown Charlotte apartment. At Camden Cotton Mills our apartment homes offer modern finishes, inspired layouts and skyline views wrapped in the architectural inspiration of Historic Charlotte Cotton Mills. 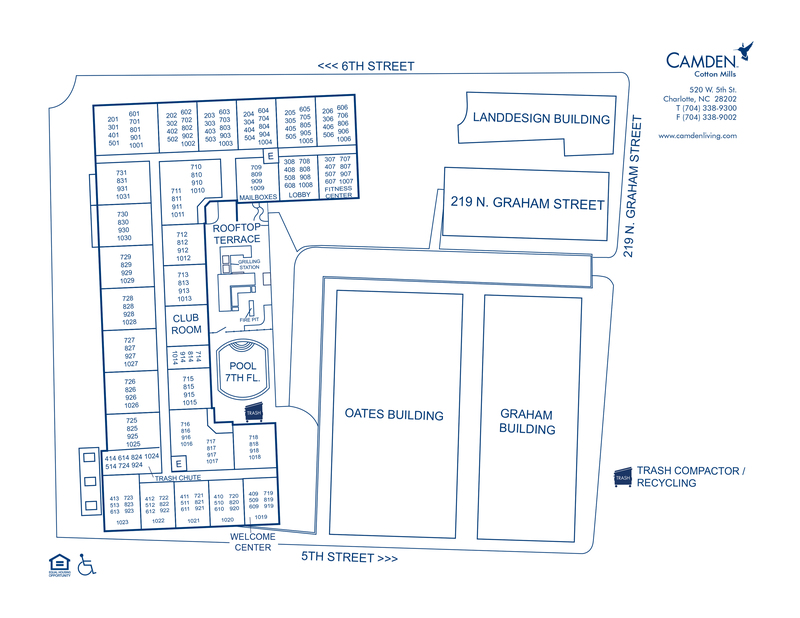 It’s a sophisticated lifestyle that comes with personalized service at Camden Cotton Mills, a non-smoking community. Modern-day conveniences and upscale amenities like a rooftop terrace with salt water pool and grilling stations, community room with full kitchen, billiards, pub tables and TVs, business center and 24-hour fitness center with cardio and free weights. Additional amenities include doorstep trash pickup and dry cleaning drop-off service. We also have your convenience in mind with a controlled access elevators, covered parking garage and bike storage. With a Walk Score of 87 out of 100, Camden Cotton Mills apartments are in the heart of Uptown, nearby bars, cuisine, shopping and entertainment. Take a stroll to Harris Teeter or Fourth Ward, the Carolina Panthers I Bank of America Stadium or the Charlotte Knights I BB&T Ballpark – all within walking distance. Rich with options and located in this sought-after Uptown neighborhood, Camden Cotton Mills apartments offers every convenience of upscale living. Come home to Camden Cotton Mills today. At Camden Cotton Mills, every day is #Caturday at our dog-free community! We welcome cats only, up to two per apartment home. Call us with any pet-related questions! We'll save a spot for you! Parking spots are $30 per month per vehicle, per resident. Each additional vehicle is $75 per month.